For years, one of the most marketable things about LEGO sets has been that you can use their pieces in your own ingenious creations. They’ve taken it a step further over the last few years, and now fan creations have the chance to become actual sets! The Ecto-1 from GhostBusters, the set of The Big Bang Theory, a collection of noteworthy female scientists… these are some of the awesome sets that were designed by amateur builders, voted on by LEGO fans, and approved to become marketed LEGO sets. 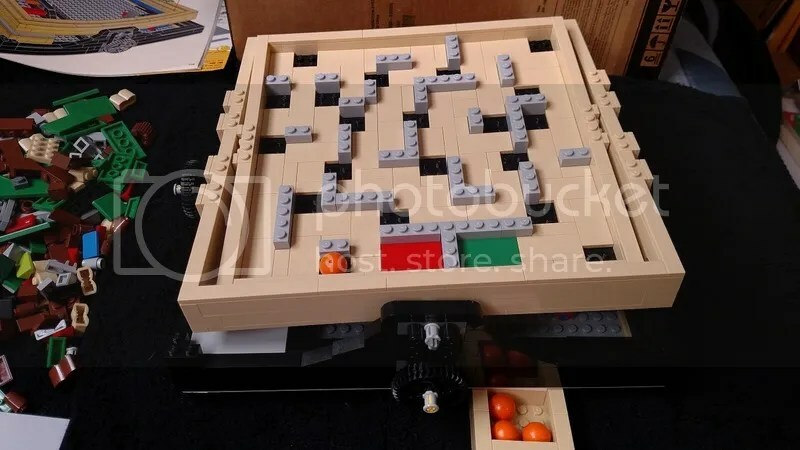 And the latest edition to that fan-created line of specialty sets is one of the puzzliest products they’ve ever sold: the LEGO Maze. 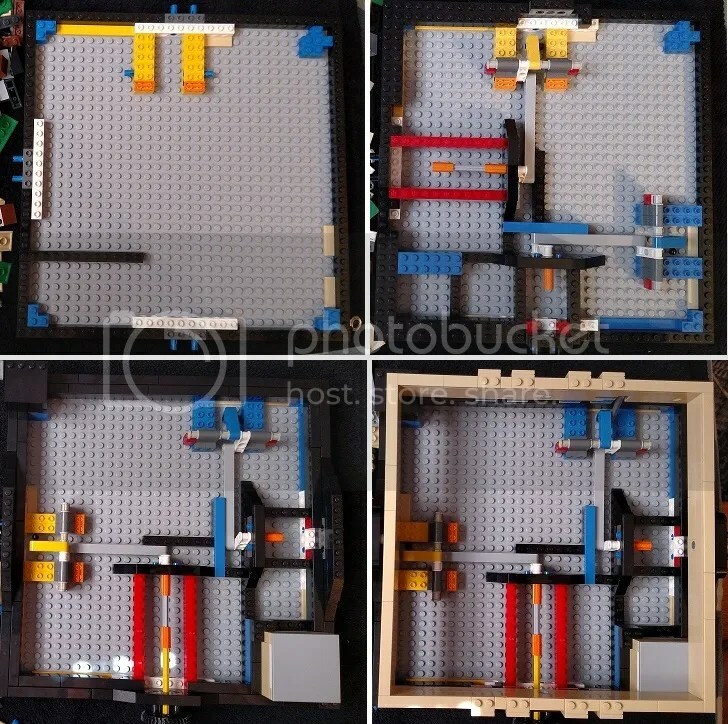 Jason Allemann of JK Brickworks created the original design, which was voted on by fans, approved by LEGO, and then improved upon by professional LEGO model designer Steen Sig Andersen. 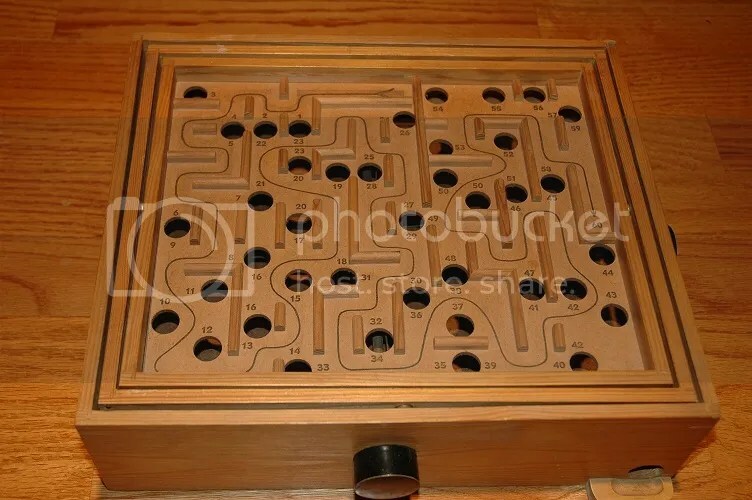 It’s based on classic wooden marble mazes; the goal is to tilt the board with the two dials on the sides of the maze in order to navigate your marble from one end of the maze to the other without dropping the marble through one of the many treacherously placed holes. 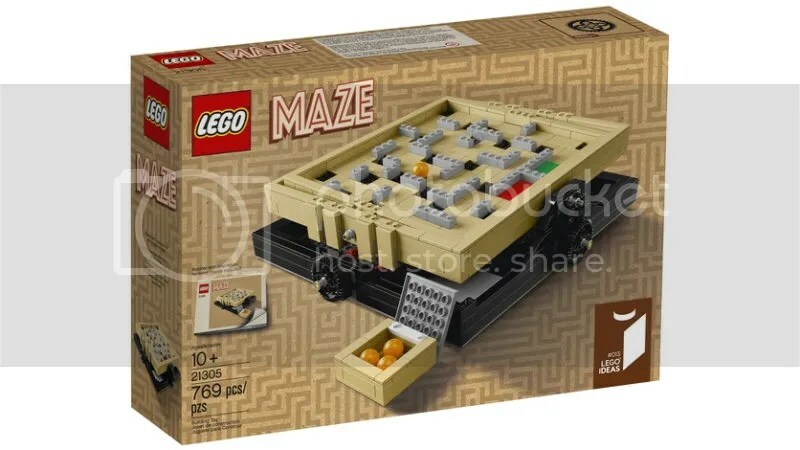 The adaptability of the maze layout is one of the highlights of this set, encouraging the same entrepreneurial building spirit that inspired the set in the first place. That being said, it’s a minor quibble. On a perfectly flat surface, a steady hand will lead you to victory, if you’re patient enough. 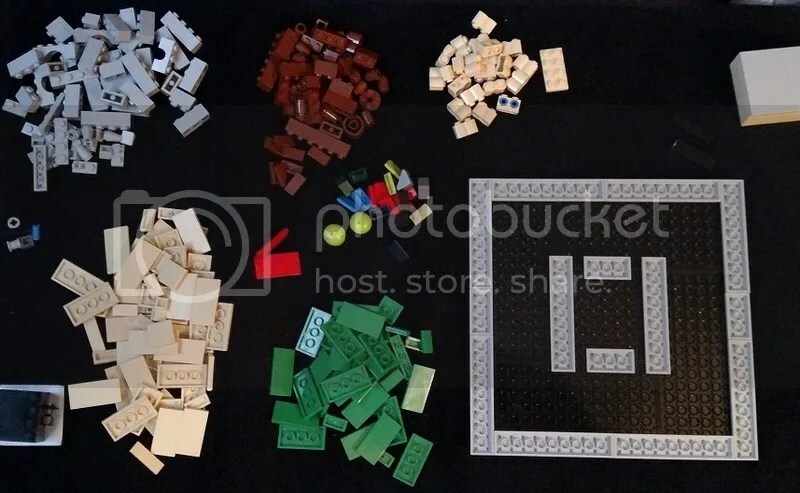 As a long-time fan and builder, I enjoyed both the simple and complex aspects of the building process, and I was surprised that they didn’t number each bag of pieces, as they’ve recently started to do with their higher-end, more complicated sets. That might put off a casual builder, but as someone who enjoys the additional challenge of digging through a pile of pieces looking for that one particular piece, I didn’t mind at all. 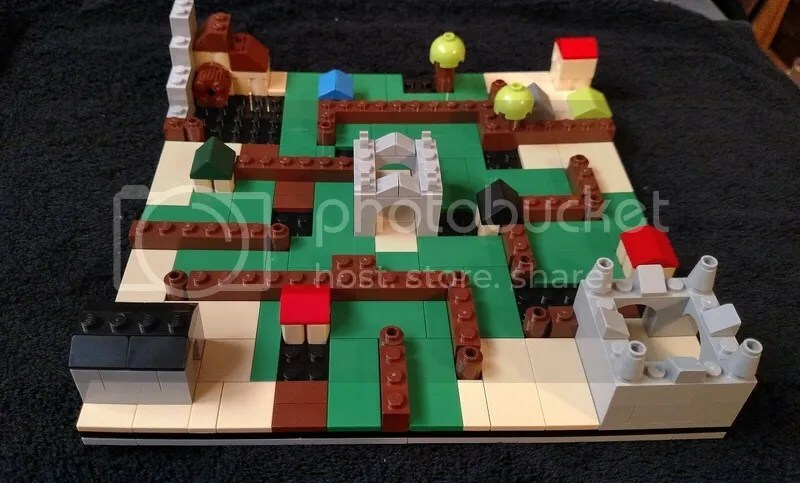 LEGO has really been pushing the boundaries of what you can accomplish with these classic interlocking bricks, and the LEGO Maze is one of the most inventive and impressive designs I’ve ever seen. Puzzles in Pop Culture is all about chronicling those moments in TV, film, literature, art, and elsewhere in which puzzles play a key role. In previous installments, we’ve tackled everything from The West Wing, The Simpsons, and M*A*S*H, to MacGyver, Gilmore Girls, and various incarnations of Sherlock Holmes. 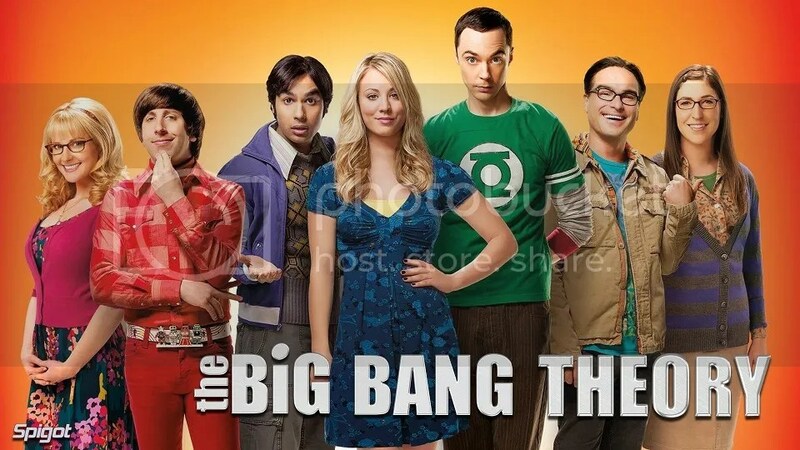 And in today’s edition, we’re delving into the world of The Big Bang Theory, CBS’s runaway hit about four nerdy scientists — Leonard, Sheldon, Howard, and Raj — bumbling their way through social interactions of all sorts. Although the show covers all sorts of activities often deemed “nerdy” — roleplaying games like Dungeons & Dragons, The Lord of the Rings, comic books, cosplay, conventions, obsessive fandom, etc. — they rarely play puzzles. Usually, the closest they get are board games and card games, whether real ones like 3-D chess or fictional ones like Mystic Warlords of Ka’a. But in episode 3 of season 7, The Scavenger Vortex, the boys and their girlfriends embarked on one of my favorite puzzly pursuits: the scavenger hunt. 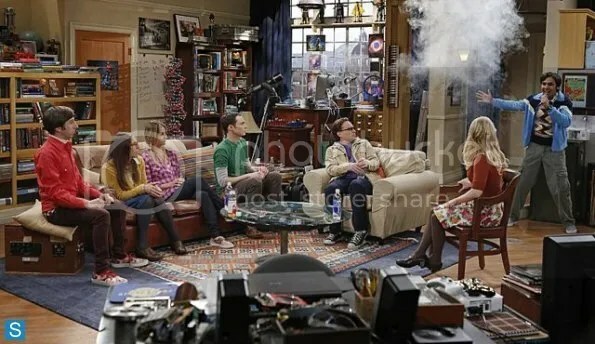 The teams end up being the odd couples of Leonard and Bernadette (Howard’s girlfriend), Sheldon and Penny (Leonard’s girlfriend), and Howard and Amy (Sheldon’s girlfriend), allowing some new pairings for the writers to have fun with. Howard Wolowitz: Wow, you’re really good at puzzles. Amy Farrah Fowler: I did them all the time as a kid. As my mom used to say: when you’re doing a puzzle, it’s like having a thousand friends. She was full of fun lies like that. 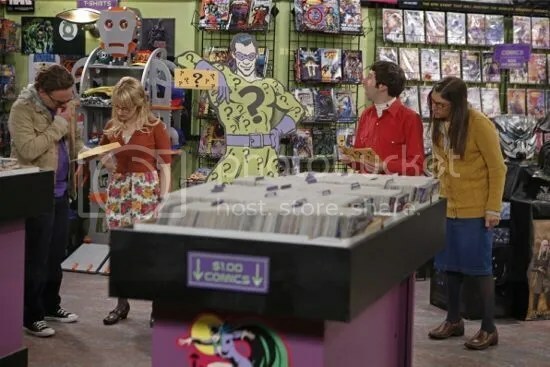 When the competitors arrive at the comic book store, a cardboard cutout of the Riddler holds their next clue. and in this room the thing you’ll see. 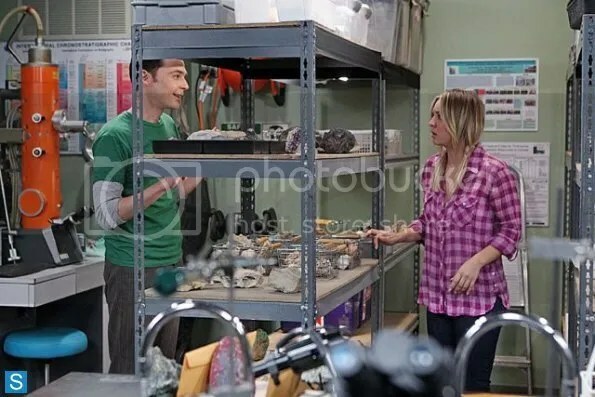 Arriving at the geology lab at the university, Penny and Sheldon reveal the next puzzle: To continue on your quest, leave no stone unturned. 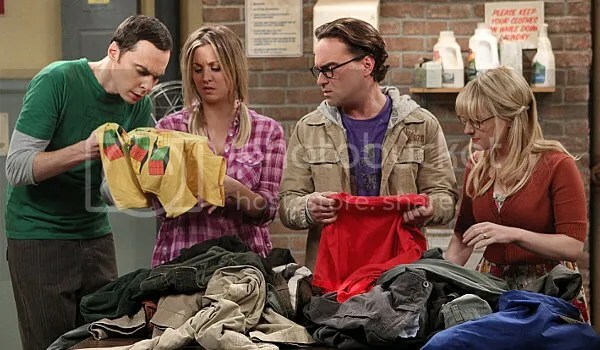 While they turn over various rock samples in the lab, Sheldon explains how he solved the riddle. Arrah pointed to Jan Arrah, a member of the DC Comics superhero team The Legion of Super-Heroes, who goes by the name Element Lad. This pointed Sheldon to the Periodic Table of Elements, where he multiplied the atomic number of N, Nitrogen (7) by the atomic number of He, Helium (2), getting 14, the atomic number of Silica, which pointed him to either the geology lab or the chemistry lab. And the final line of the riddle — “and in this room, the thing you’ll see” — pointed toward the Marvel superhero The Thing, who is made entirely of rock. As Sheldon is showing off his impressive riddle-cracking skills, underdog Penny actually solves the current puzzle, realizing that “no stone unturned” didn’t mean the samples in the lab. It meant the Rolling Stones poster hung on the door, which she lifts to reveal map coordinates. This sends them to a bowling alley, and then to the disused elevator shaft in Leonard, Sheldon, and Penny’s apartment building. A montage mentions further puzzles at the planetarium and the tar pits (and plans to attend a Neil Diamond concert for new chums Howard and Amy), before ending up in the laundry room at Leonard, Sheldon, and Penny’s apartment building. Three bags of laundry await the players, and they quickly realize each bag contains only pants, except for a single shirt of Sheldon’s. A shirt with a spot on it. Fans of the show, of course, know where their final destination — and the coin — awaits them. But when they tear apart the couch, there’s no coin. And although Raj’s big lesson — it’s getting together and playing that’s important, not the prize at the end — is lost on his fellow castmates, it really does encapsulate the best in group puzzling and gaming… the experience. 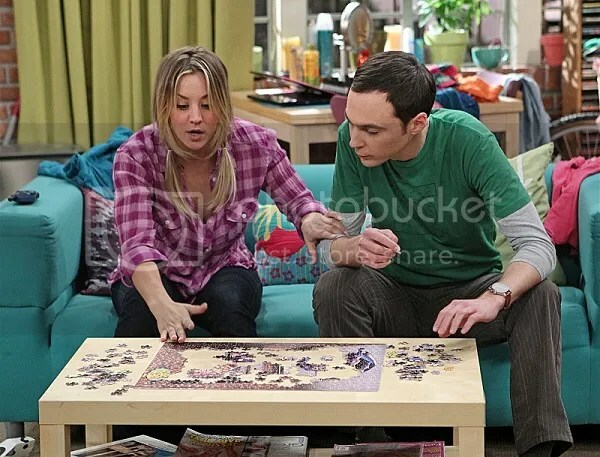 Maybe The Big Bang Theory gets puzzles after all. 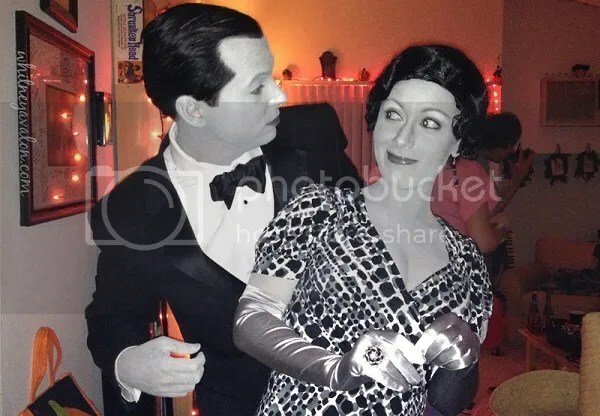 And I’m overjoyed to have Whitney Avalon as our latest 5 Questions interviewee! Whitney is a quadruple threat, splitting her time between acting, music, comedy, and puzzles, leaving her distinctive mark on each field. 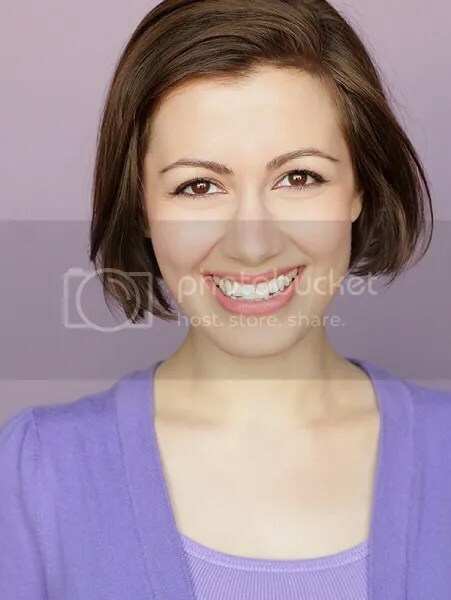 You may have seen her on The Big Bang Theory, in the Cheerios commercial during this year’s Super Bowl, or in the delightful viral video series IKEA Heights (which was secretly shot in an IKEA during working hours). Then again, you might have seen one of her songs or parodies on YouTube, or solved one of her puzzles in GAMES Magazine. When you’re dealing with someone as creative and prolific as Whitney Avalon, you’re bound to have stumbled across her work somewhere. Whitney was gracious enough to take some time out to talk to us, so without further ado, let’s get to the interview! That I can blame, with great joy and gratitude, on my parents. My dad has worked in computers since before most people really knew what computers were, and he started me as a toddler on simple graphical puzzles (“One of these shapes is not like the other” springs to mind) and programming languages. Growing up in a family of thinkers meant I got to fall in love with wordplay, logic, and eureka moments. Lucky me! 2.) You’re an actress, writer, comedian, and singer, but you’ve also had puzzles published in GAMES Magazine and other outlets. Do you have a particular favorite creative activity or one you wish you could devote more of your time to? I’m one of those people fortunate enough to have always had one overriding passion (creating) who then gets to make a living pursuing that passion every day. So while the tide ebbs and flows – after all, I don’t get to choose when a TV show casts me, but I’m happy to drop everything else for a while every time one does – I love all the different ways I can make stuff that others might enjoy. I try to dedicate myself wholeheartedly to the next creative project in front of me, even and especially if it’s nothing like the one just completed! 3.) Has constructing puzzles influenced how you approach putting together videos, songs, or other visual media? Or has working in so many creative fields influenced your puzzling style? I think spending a lot of time solving and/or crafting puzzles has, perhaps, made me more likely to strive for innovation, in that the repetitiveness of certain traditional forms might mean I’d seek more out-there options when it’s my turn to make the rules. Or maybe having a vivid imagination makes me drawn to interesting, elaborate puzzles. I’m probably not good at analyzing my brain from inside here, but there are definitely parallels between taking the viewer on a good journey through a film or song and taking him or her on a good journey through certain puzzles – one of my published works, for example, is a 1000-word short story that not only contains a solvable mystery but also an additional layer of meta-surprise the reader will discover as it’s read. 4.) What’s next for Whitney Avalon? More television appearances and commercials! (Including Girl Meets World on Disney Channel.) More writing! More singing! (I front pop rock band Strangely Attractive.) And, I surely do hope, more puzzles! (Most likely to appear as exclusive content in my monthly newsletter.) I can’t wait to see where the creative winds take me this year, and I’d be delighted if folks want to join me on my travels. I’ll always do my best to make you smile, laugh, and think. 5.) If you could give the readers, writers, aspiring content creators, and puzzle fans in the audience one piece of advice, what would it be? Take a moment to ponder how improbable it is that you exist at all. Grin. Be kind. Have fun. Revel in your glorious good fortune. Many thanks to Whitney for her time. You can follow her on Twitter (@whitneyavalon) for the latest updates, watch her videos and songs on YouTube, check out her website, and sign up for her monthly newsletter! There’s no telling what entertaining endeavors she’ll have for us next.